The highly anticipated twenty-fifth North Atlantic Treaty Organization summit began May 20 in Chicago; most of the NATO member states are facing defense budget cuts, their publics have grown tired of the war in Afghanistan, and some are worrying about NATO inevitably becoming militarily irrelevant. In an election year, the Obama Administration wants to look strong on defense while leading the alliance to a reasonable exit from Afghanistan. Despite the Administration’s policy ‘turn’ to the Asia-Pacific, NATO remains a formidable alliance structure unlike any other. While not all 28 members may pull their weight (only two states follow the mandate that defense budgets be 2% of GDP), the collective defense alliance remains a pertinent force that states in East Asia and the Pacific were never able to replicate. Smart Defense and the institution of missile defense capability have been achievements outside of the ISAF operation in Afghanistan. In Lisbon in 2010 NATO leaders agreed to develop a missile defense capability, and that concept has now come to fruition. In Chicago, leaders announced that they have achieved an interim missile defense capability. NATO Secretary General Anders Fogh Rasmussen stated “Our system will link together missile defense assets from different Allies – satellites, ships, radars and interceptors – under NATO command and control. It will allow us to defend against threats from outside the Euro-Atlantic area.” The controversial capability has added tension to the Russia-NATO relationship, but NATO has not left any room to back down. The forward-looking nature of discussions illustrates that member states see the benefit of maintaining a strong and cohesive structure and scope. While NATO assists with anti-piracy in the Gulf of Aden, intervened in Libya and participated in a training mission in Iraq, it is important that NATO does not get overstretched or over-utilized in conflicts around the globe (that are not related to Article 5 of the Treaty). The collective defense treaty should not get confused with international peacekeeping or policing forces; given that NATO member states do not explicitly seek expansion of activities much outside of their realm, regional powers in Asia have no cause for concern regarding the missile defense or smart defense initiatives. Furthermore, NATO member states will be relieved that they are not being coerced into the Obama Administration’s overt Pacific turn. May 13, 2012 May 28, 2012 by Genevieve Neilson, posted in D.C.
Each year in Washington, DC, dozens of embassies open their doors to the public as part of the Cultural Tourism DC event Passport DC. Of course, no passport is needed to explore each of the embassies – but a mock ‘passport’ is supplied and volunteers offer to ‘stamp your passport’ at each destination. Each embassy proffers a national identity fashioned out of a constellation of cuisine, culture, geography, fauna and flora. Each embassy presents an image of their national history, culture and current endeavors as part of the international community. At the same time each embassy is impelled to direct guests through security, including the metal detectors and bag checks that have become a part of life for international travelers and border commuters, and point to the anxieties of our age. On Saturday, May 26, 2012 I participated in Passport DC by traveling to 5 diverse embassies including Australia, Kazakhstan, Mozambique, Montenegro and Indonesia. As one would expect on such a day, each embassy I visited selected cultural symbols to reflect their respective states; this post briefly discusses features of the embassies I visited. The Australian embassy brought together indigenous culture, representations of their foreign military service and exports as facets of Australia’s identity. 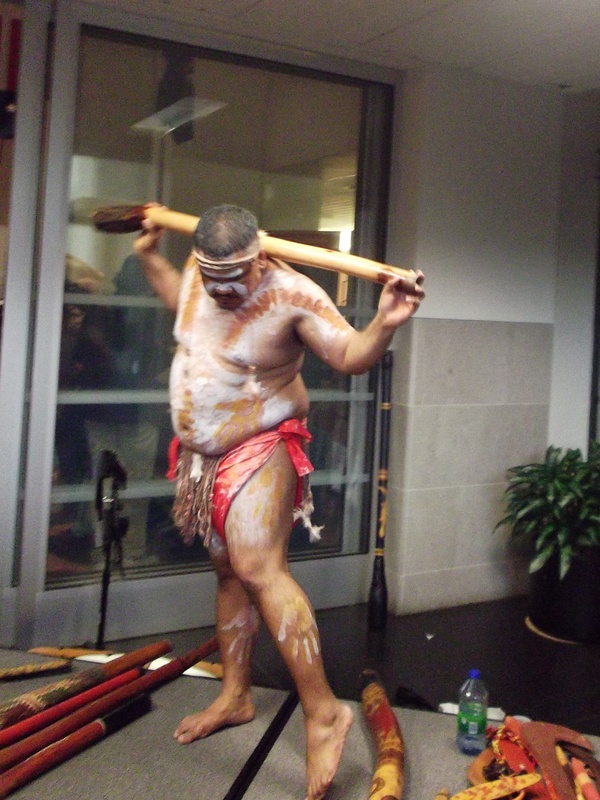 After going through a metal detector and bag check, the first representation of Australia was a man dressed and painted in Aborigine style, holding a didgeridoo and discussing the different types of boomerangs. Further along, there was a table set up for children to paint Aborigine-style art. While aspects of the rich culture of Australia’s indigenous peoples are often featured in Australia’s tourism material, it is interesting to note that Aborigine groups have their own embassy – the Aborigine tent embassy – set up on the lawn of Australia’s Parliament House in Canberra to represent their feeling of alienation within their home country. Aborigines were subject to similar treatment as Native Americans and are still largely relegated to marginalized communities even though they hold a central place in how tourists imagine Australia. 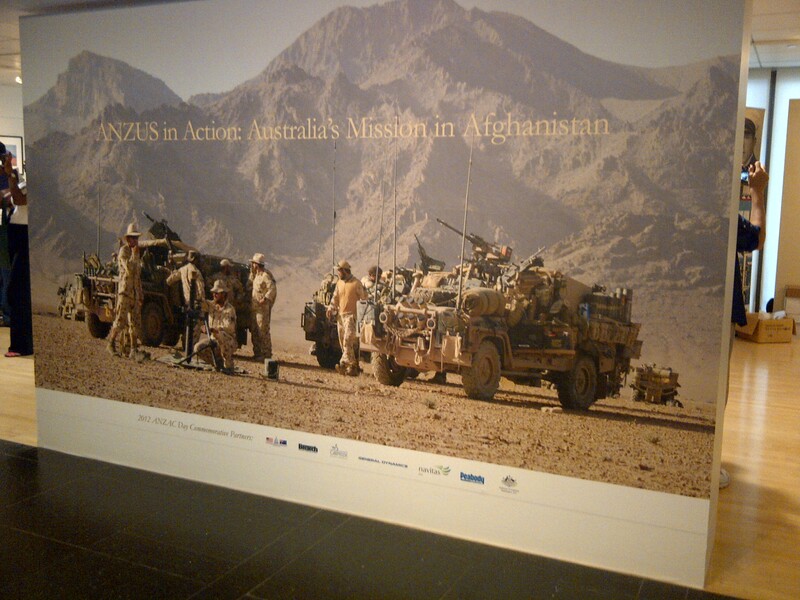 Along one side of the embassy was a gallery of images of the Australian commitment to ANZUS, an exhibit of photos from the war in Afghanistan. Uniformed Australian military personnel staffed an information table and told me about how thrilled Australians were when US President Barack Obama visited the country last year. Obama had announced the posting of 200-250 marines in Australia’s northern coastal city of Darwin amid discussions of the US turn to the Pacific and comments about a rising China. Next there was a wine and cheese tasting, under the starry Southern Hemisphere’s night sky, which was displayed on the embassy ceiling. Australia’s wine industry gained a big foothold in the US and other overseas markets, and is definitely more popular abroad than the Vegemite which was also on offer. The Australian wine industry has weathered booms and busts due to differing grape yields and shifts in international currencies. Australian wine regions have also become a draw for travelers; although when I asked a travel agent posted at the embassy what there is to see and do in Perth since I plan to travel there later this year, she disappointingly told me that there was nothing to do in Perth; however, I could travel about an hour north to see some dolphins. I guess I’ll have to see for myself. 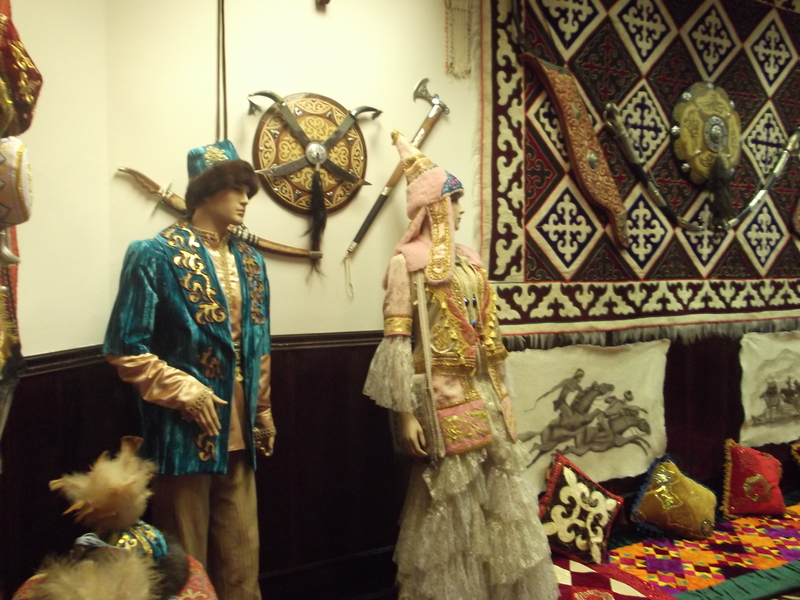 The Embassy of Kazakhstan was a more subdued experience compared to the Australian embassy, with pictures and artifacts portraying a country on the move but still valuing its heritage. Two Kazak embassy personnel staffed a long table displaying postcards, brochures, tourism books, investment magazines and the book The Kazakhstan Way by President Nursultan Nazarbayev (who was the leader of Kazakhstan during its Soviet era and holds the same office today) all complimentary to visitors. I picked up President Nazarbayev’s book, but I am yet to brave its 329 pages, complete with a forward by Margaret Thatcher. The materials sparked questions by visitors about traveling to and through the country with the Trans-Siberian railroad, and what sort of industries are most profitable. Kazakhstan expects to join the World Trade Organization this year. It occupies an important geographical position between Russia and China, and it has been trying to break free from its ‘Dutch disease’ (an economic overreliance on extraction and oil industries). The items on the table most sought after by visitors, however, were the bars of Kazak chocolate. We were told that the chocolate is not a major export product from Kazakhstan – the cocoa is likely imported from Africa – but it reminds the embassy staff of home. I was told that “everyone in Kazakhstan loves this chocolate”. I intended to visit the Embassy of Botswana next, but I was deterred by the perpetually long line. 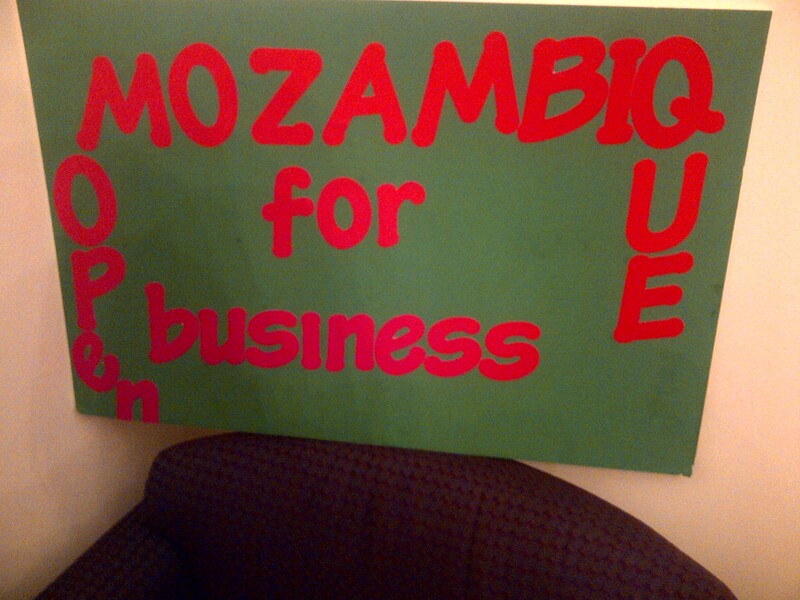 Instead, I toured the Embassy of Mozambique. 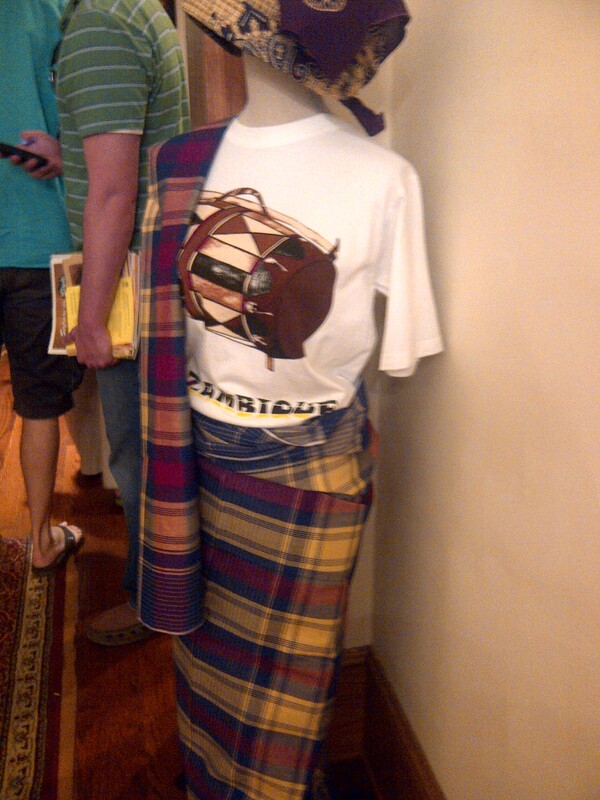 Emphasizing “Mozambique is open for business”, the embassy displayed carvings, costumes, artwork and tourism posters, and selected jewelry was also offered for sale. Hand-made posters and the small building were evidence that the Mozambique Embassy was not running on a large budget, and that the country was not as wealthy or developed as some of its neighbors along embassy row. While Mozambique managed a reputable 7.2 percent growth rate in 2011, the nation-state is still mired in poverty and relies heavily on aluminum exports and subsistence agriculture. However their nationalism and desire to put forward a friendly, welcoming image was still just as strong as the other embassies. After Mozambique, I had an even shorter stay at the Embassy of Montenegro. Staff led visitors upstairs to a large room where we watched a tourism video advertising hotels and places to visit in Montenegro. After several minutes of the video, once it had become a reel of hotel advertisements, I excused myself. 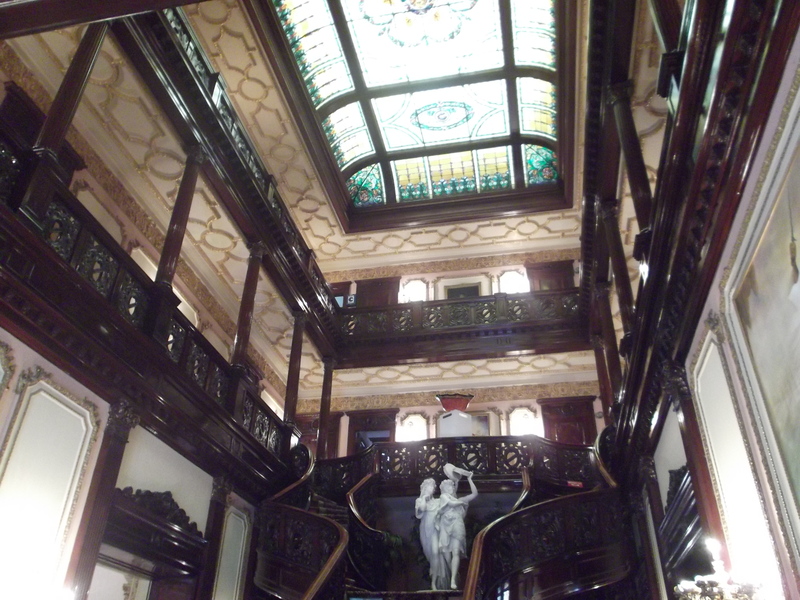 The embassy itself was in a multi-story house, with more gold and elaborate chandeliers compared to the Mozambique embassy. However the staff and atmosphere drew my spirits down leaving me less than enthused about a visit Montenegro. As the Mozambique embassy’s colored card poster pointed out, Africa is “open for business.” As much of Africa still stands at the margins of international trade, it is quickly becoming the latest frontier for international investment, especially for China. Africa’s most sought after natural resources have been the focus for business men from the continent and abroad for some time, but it is likely that the populations of Africa’s nations will be drawn into more sustained production of commodities over the coming years. My last stop for Passport DC was the Embassy of Indonesia. After getting through the security line and up the steps, the grandness of the entrance felt like I was on location for a film set in colonial Southeast Asia. With 6.5 percent growth in GDP in 2011 and continuous flows of FDI ($19.3 billion last year) Indonesia has been making headlines lately for its impending economic might. Indonesia was one of the countries worst hit by the 1997 Asian financial crisis and recent economic gains from which some Indonesians are profiting need to be understood against this not so distant crisis that also followed sharp gains in the 1990s. The embassy was grand but any economic prowess did not overshadow the warmth of the staff and the significance of the different Indonesian cultures to the state. Indonesia is an archipelago with around 6000 inhabited islands, 300 native ethnicities and 742 dialects. The country was demarcated under Dutch colonial rule and has since experienced ongoing separatist conflicts against the government, based in the capital Jakarta on the island of Java. In the embassy one of the rooms had display cases and shelves full of dolls dressed in traditional Indonesian fashion, separated by different regions and cultures, alongside handicrafts and works of art. A band played earlier in the afternoon, in addition to martial arts and dance exhibitions. Outside, they served Indonesian coffee – a crop brought to Indonesia by the Dutch East India Company – and offered sculptures and crafts for sale. As Charles Tilly famously noted, writing about the European context, the “state-making process minimized the cultural variation within states and maximized the variation among states.” Embassies involved in Passport DC attempt to present cohesive national images and, in so doing, also place themselves within the community of nation-states. Passport DC is an enlightening experience, made more so by delving below the national images to see the patchworks that constitute these modern nations and that threaten to unravel national cohesion at the seams.